Stokesley had a parish workhouse accommodating fifty inmates in operation on High Green from as early as 1755. A number of other parishes in the area paid for paupers to be taken by Stokesley. Other small workhouses were set up in the 1770s at Hutton near Rudby and at Whorlton, and another in 1785 at Great Ayton (Hastings, 1996). Some of the Poor are maintained in a house rented by the parish, some in cottages, the rent of which is paid by the overseers. The Poor-house is in good condition. Paupers are taken in at 20d. a week each. Other parishes send their Poor when the house is not full. The master receives the profit of the work done, less a small deduction for each pauper, according to the earnings. Table of diet: Breakfast—every day, milk and oatmeal. Dinner—Sunday, beef, roots and dumplins; Monday, hasty pudding, oatmeal; Tuesday, frumenty French barley; Wednesday, beef broth and bread; Thursday, frumenty; Friday, fry and potatoes; Saturday, potatoes and butter and salt fish. Supper—every day, milk and oatmeal. Only one person has died in the house in the last three years. The rate is 6d. in the pound on land and 3d. on houses. Frumenty was a soup or sauce made by boiling up milk and wheat grains. North Riding of Yorkshire: Great Ayton, Little Ayton with Tunstall, Great and Little Broughton, Great Busby, Little Busby, Carlton, Crathorne, Easby, East Rouncton, Faceby, Hemlington, Hilton, Hutton Rudby, Ingleby Arncliffe, Ingleby Greenhow, Kildale, Kirkby in Cleveland, Marton, Middleton upon Leven, Newby, Nunthorpe, Potto, Rudby in Cleveland, Seamer, Sexhow, Skutterskelf, Stokesley (2), Whorlton. Later Additions (from 1876 unless stated): Bilsdale Midcable (from 1848), Castle Leavington, High Worsall, Kirk Leavington, Low Worsall, Picton, Yarm. The population falling within the Union at the 1831 census had been 9,618 with parishes ranging in size from Sexhow (population 35) to Stokesley itself (1,967). The average annual poor-rate expenditure for the period 1834-36 had been £4,115 or 8s.7d. per head of the population. Initially, Stokesley appears to have resisted the requirements of the 1834 Poor Law Amendment Act. The union retained the Stokesley workhouse but declined to spend any money on its adaptation for the requirements of the Act. In 1839, it was one of 37 unions noted by the Poor Law Commissioners "which for the present decline to concur in providing an adequate Workhouse". In 1841, the union was described as "one of the most unbusiness-like unions with one of the most ineffective workhouses." The dilapidated building lack receiving, sick, and vagrants' wards and was unable to provide segregated accommodation for the different classes of inmate. Eventually, in 1847, the Stokesley Guardians were persuaded to build a new workhouse accommodating 104 inmates at a site to the north-east of Stokesley. Completed in 1848, it comprised a single-storey entrance range with a two-storey main block to the rear. The location and layout of the workhouse are shown on the OS map of 1856. Stokesley entrance block from the south, 2001. 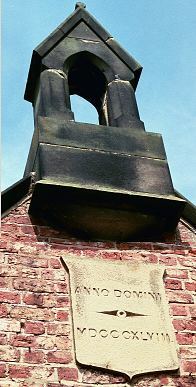 Stokesley bell turret and date plaque, 2001. Stokesley main block from the south-east, 2001. Female inmates performed domestic work while males were employed in oakum picking and working in the vegetable garden. Vagrants were required to undertake a certain quantity of stone-breaking and, until 1871, were given only bare boards to sleep on. In 1876, the creation of the new Middlesbrough union led to a reorganisation of union boundaries in the area. Stokesley lost Hemlington and Marton, to Middlesbrough but gained Castle Leavington, Kirk Leavington, High Worsall, Low Worsall, Picton and Yarm from the Stockton union. 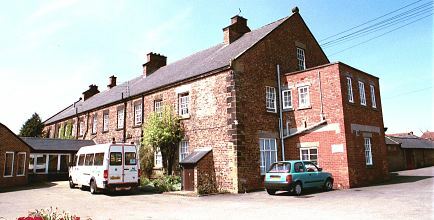 The former Stokesley workhouse building is now used as a residential care home. Stokesley Workhouse by Dr P Hastings (1996, Ripon Museum Trust leaflet).